Jet Airways and Kingfisher Airlines–Retail Investors Deja Vu !! An older article on my Blog. Why do Traders Go Bust and Investors Get Lost !! The only way one can explain Retail Investor increasing in Kingfisher Airlines is – Hope for Good Things to happen !! · Shareholders holding upto 1 lakh paid up capital went up from 50k in 2008 to 2.3 lakhs in Sept 2014. · In March 2012 there were 1.35 lakh shareholders and by September 2014 there were 2.3 lakh. · The terrible part number of shares from 2012 to 2014 went up from 5.5 crores to 21 crores !! The behaviour just does not change. The sad part is we had 2.3 lakh retail shareholders in Kingfisher but a company like Kotak Mahindra Bank has 2.23 lakh retail shareholders !! Doing a quick check we see a Pidilite , Bata , Voltas and many known companies have lesser retail shareholders ( 2 lakh capital ) compared to a 1,37,524 of Jet Airways. Many smaller companies with longer track records have barely 5k-50k retail shareholders. Will this ever change ? Author Nooresh MeraniPosted on April 19, 2019 Categories UncategorizedLeave a comment on Jet Airways and Kingfisher Airlines–Retail Investors Deja Vu !! 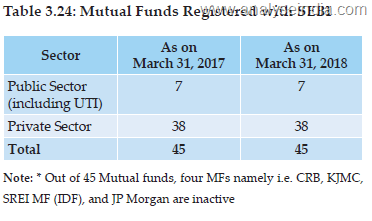 The value of assets held by individual investors in mutual funds increased from Rs.11.66 lakh cr in March 2018 to Rs.13.54 lakh cr in March 2019, an absolute increase of 16.08%. 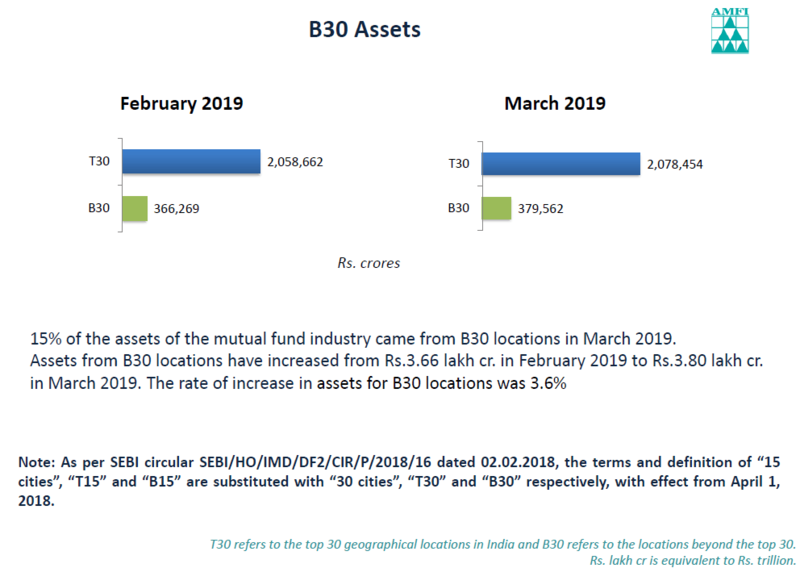 In March 2019, 23% of assets held by individual investors is from the B30 locations. 6% of institutional assets come from B30 locations. Institutional assets are concentrated in T30 locations, accounting for 94% of the total. The proportion of direct investments in equity, to the total assets held by individual investors, was about 8% in March 2019. Only 12% of the Individual Investor money in Equity Mutual Fund comes through the direct route out of that 10% comes through the direct route in T30 cities. Interesting to see – Manipur, Nagaland, Arunachal Pradesh, Andaman and Nicobar, Tripura, Sikkim, Mizoram and other smaller states slowly getting penetrated but are still miniscule ranging from 300-1200 crores. 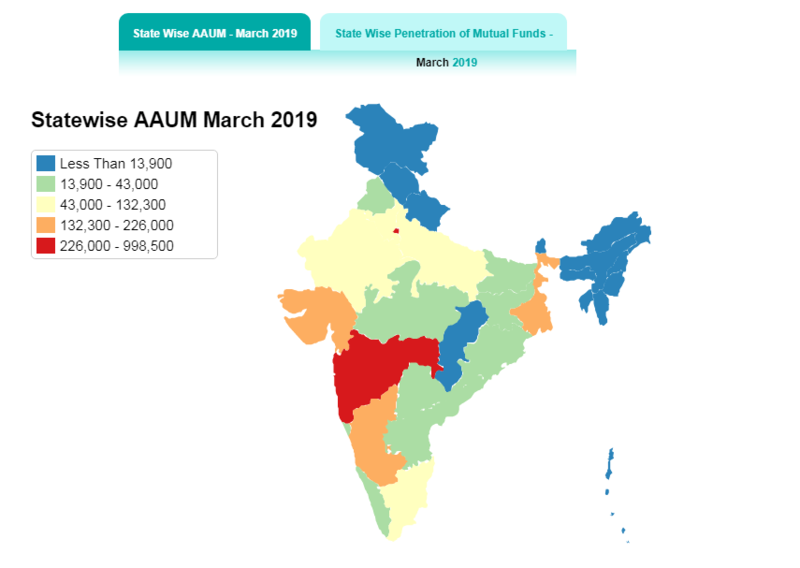 Indian Mutual Funds have currently about 2.62 crore (26.2 million) SIP accounts through which investors regularly invest in Indian Mutual Fund schemes. 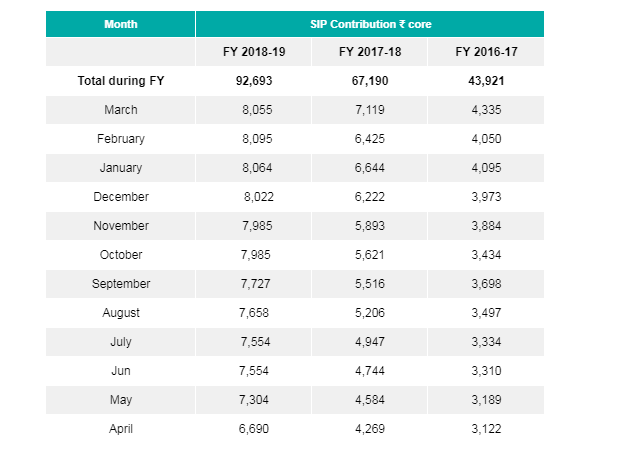 AMFI data shows that the MF industry had added about 9.13 lacs SIP accounts each month on an average during the FY 2018-19, with an average SIP size of about ₹3,070 per SIP account. One way to source for ideas to research is to look for promoters increasing stake in their companies. may no longer be valid as global bond yields will likely stay subdued due to a synchronized global economic slowdown. making the valuation argument largely redundant for such stocks. stocks and (2) long-term losers; companies with inferior business models and poor governance practices where no price or valuation may be too low to avoid the stocks. Indias Contribution to World Market Cap – Higher than Average but lower than the highs. SEBI Categorization of Large Cap/Midcap and Smallcap. 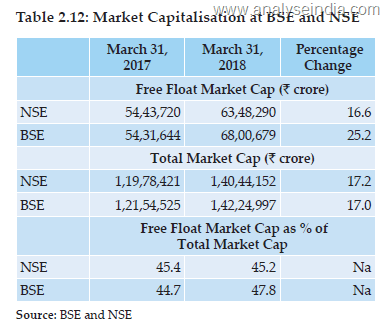 SEBI in its circular https://www.amfiindia.com/Themes/Theme1/downloads/1507291273374.pdf has come out with a way of defining large-caps/midcaps/small-caps. There are 1624 companies in the NSE and 4649 companies on BSE as per the data. 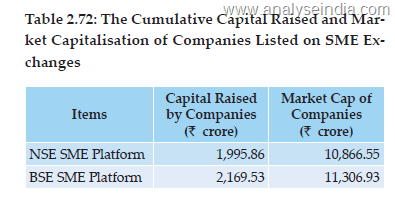 The cut-off for companies to be a Mid-Cap is 8600 crores. Any company less than that is a Small-cap. There are just 779 companies with an average 6 month market-cap higher than 1000 crores. So roughly around 529 companies in the band of 1000 to 8500 cr market cap. There are approx. 1700 companies with an average market cap of 100 cr. 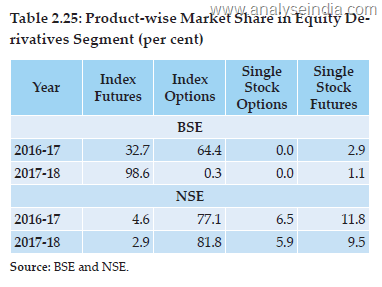 The Contrast of AMFI/SEBI Categorization with NSE Indices. The categorization is based on 6 months average Full Market Cap. This is a stark contrast to the fact that all Mutual Funds are benchmarked to indices which have a free float market-cap methodology. Another contrast is SEBI/AMFI wants low churn by Fund Managers and trying to limit the number of schemes etc and want them to be long-term investors but expect them to re-balance every 6 months on basis of price movements. The categorization of Stocks changes every 6 months and there is no limit to it. So a lot of stocks will keep changing from Large Cap to Midcap or Midcap to Smallcap and vice versa in the categorization. In contrast, Nifty Index constituents can change every 6 months but have a limitation of only 10% of the constituents to be changed in a year for Nifty. Also replacing stock has to 1.5x free float market cap to the lowest weighted stock. For example, Nifty 500 can make 50 changes in a year and Nifty50 can do 5 changes in a year. This difference of in categorization will keep leading to a major difference in Midcaps as per AMFI categorization and Midcap/Smallcap as per the NSE Indices. Funds now have another headache as benchmarks and AMFI classifications do not match. The difference in the categorization of Nifty Indices with AMFI categorization. PRESTIGE Prestige Estates Projects Ltd.
BERGEPAINT Berger Paints India Ltd.
LTI Larsen & Toubro Infotech Ltd.
BLUEDART Blue Dart Express Ltd.
GET&D GE T&D India Ltd.
BAJAJHLDNG Bajaj Holdings & Investment Ltd.
ABCAPITAL Aditya Birla Capital Ltd.
BHEL Bharat Heavy Electricals Ltd.
LICHSGFIN LIC Housing Finance Ltd.
SRTRANSFIN Shriram Transport Finance Co. Ltd.
SUNTV Sun TV Network Ltd.
Of the 223 issues, 216 were from the private sector which raised ` 68,870 crore compared to 118 issues that raised ` 31,683 crore in 2016-17. In the cash segment, the turnover at NSE increasedby 43.1 per cent during 2017-18 compared to 19.3 per cent growth in the previous year. The turnover of BSE too increased by 8.5 per cent during 2017-18 compared to 34.9 per cent growth in the previous year. The turnover of all stock exchanges in the cash segment increased by 37.4 per cent to ` 83.2 lakh crore in 2017-18 from ` 60.5 lakh crore in the previous year. Of the aggregate turnover, NSE accounted for 87 per cent of the total turnover and BSE accounted for 13 per cent of the total turnover. Over the years, index options have emerged as the most traded instrument in the Indian derivatives market. 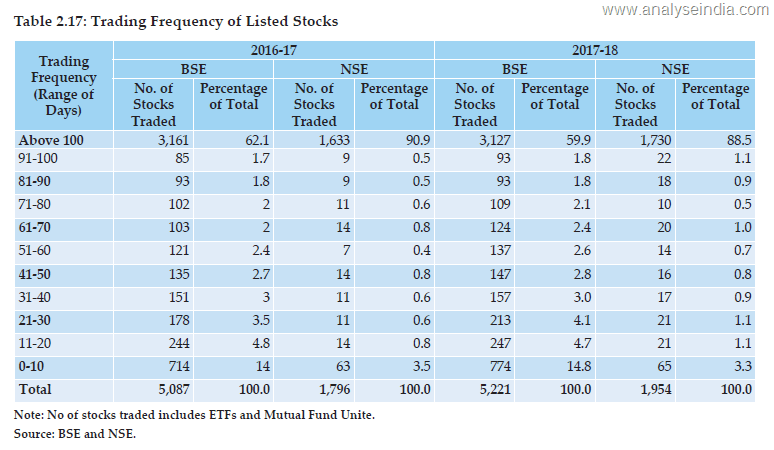 During 2017-18, the share of index options in total turnover at NSE increased further to 81.8 per cent from 77.1 per cent in the previous year. 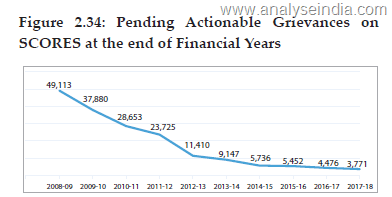 During 2017-18, the total amount of fees and other charges received was ` 624.44 crore (audited) as against ` 518.75 crore in 2016-17 (audited). The recurring fee was 48.90 percent in 2017-18 as compared to 60.70 percent in 2016-17 of the total fee collected. 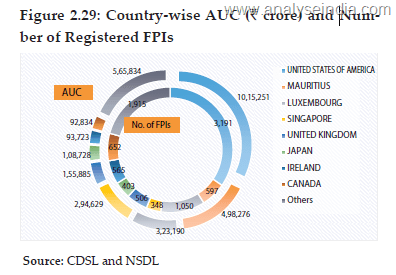 During the year 2017-18, the largest recurring fee of ` 78.00 crore was collected from Derivatives Members registration followed by ` 40.82 crore collected from Stock Brokers and Sub- Brokers. In non-recurring fee category, the highest fee was collected from Offer Documents and prospectuses filed (` 112.24 crore) followed by Buy Back of Share (` 106.12 crore) and Takeover Fees (` 29.70 crore). As on March 31, 2018 the total number of employees in various grades is 794 (including employees on deputation/ contract), out of which 698 employees are officers and 96 employees comprise secretaries and other staff. The male and female composition is 527 and 267, respectively. 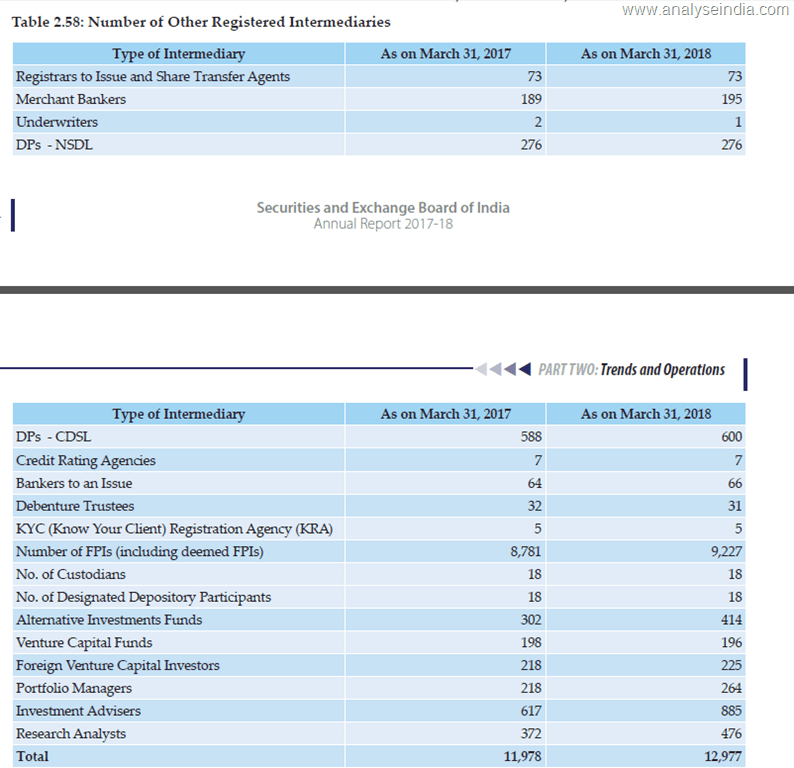 There is a very long section on SEBI orders which is very interesting to see actions taken and how much time it takes. 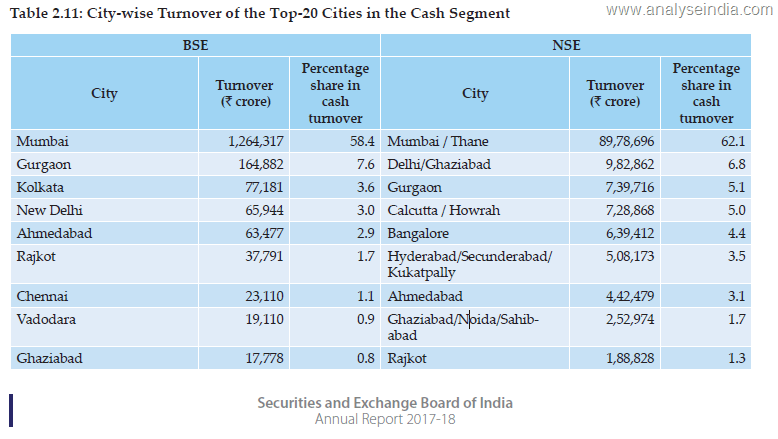 Mumbai continues to be the leader in turnover. Free Float Market Cap at 45% of total market cap. Only 3121 stocks trade for more than 100 days.. No of listed maybe 5200. Only 1730 stocks have traded from more than 100 days regularly on NSE. 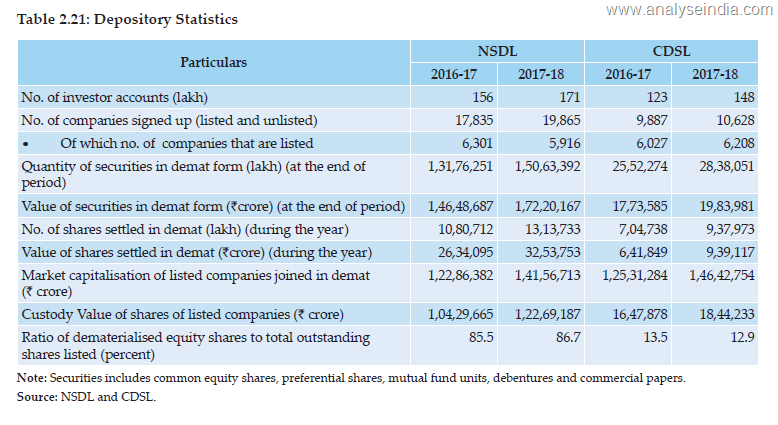 CDSL catching up in terms of investor accounts but value-wise NSDL is way above. 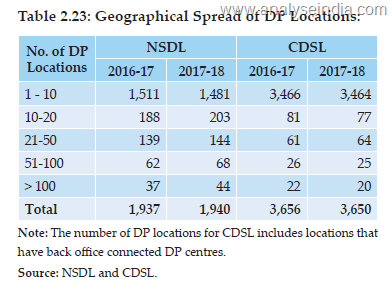 CDSL leads in geographical spread of DP locations. Options share increasing. But its due to calculation on notional value of the contract. Good increase in AUM and no of clients in PMS. AIFs picking up big time. No of SME listings are ramping up in a very big way. Market cap is still small. Pending actionable grievances being reduced at a great rate. Given the high networth requirements doubt no of MFs are going to grow anytime soon. Way too much surveillance ? Look at this snippet from Kotak Institutional Research Report. Almost all the stocks are in downtrends and have corrected more than 20% from their highs. An interesting take from Cartica Capital which is the 2nd largest public shareholder in the stock after Nalanda. Check 2.40 to 4.10 . The overall interview is also interesting.